Pets are an important part of our lives and can make a difference in our health. 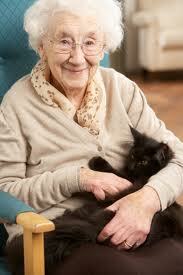 In assisted living communities it has been found that pets provide many health benefits. Having or being around a loving animal has shown to ease pain, increase brain activity, increase physical activity and promote better mental health. There’s just something about sitting with or petting an animal that brings us comfort and joy. This month, Simply55.com magazine published an interesting article about pet ownership and health. Thought you’d find it a great read. Taking care of a furry friend may require your time, money, and energy, but there are payoffs to having a pet in your home. In fact, the research shows that having a pet can benefit both your physical and mental well-being. Read on to learn more. Having a pet may improve your physical health, according to research. A study published in a 1991 edition of the Journal of the Royal Society of Medicine followed pet owners for a 10-month period after they brought home either a dog or a cat, and a group of individuals without pets served as a control. Both dog and cat owners experienced fewer minor health issues during the first month of having a pet, and dog owners experienced a decrease in health issues for the entire length of the 10-month study. Both dog and cat owners scored better on a test called the General Health Questionnaire. The relationship between pet ownership and improved health may be a result of physical activity. For instance, in the 1991 study published in the Journal of the Royal Society of Medicine, dog owners completed more exercise due to walking their dogs, and they engaged in greater amounts of physical activity for the duration of the study. A study published in 2008 in the Journal of Physical Activity and Health produced similar results, finding that dog owners were more likely than those who did not own dogs to walk for leisure. A study published a year later in the same journal found that dog owners completed significantly more moderate and vigorous physical activity than those who did not own dogs, and they spent less time being sedentary than those without dogs. In addition, dog owners in the study were 1.5 times more…Read the complete article here.